The traditional India was vibrant with the mantras and prayers of the hermits. Here the small state, described as God’s own country is decorated with beautiful green valleys and golden fields. The traditional village, Kozhuvanal in the district of Kottayam was famous for its diligent farmers. In that beautiful village, in the traditional Kaippanplackal family, Avirachan(Fr. Abraham) was born as the youngest son of Joseph and Thressia on 16th April 1914. He was born as a good Samaritan to heal the wounds of the wounded and an angel to bring the gospel of peace in the midst of peace less world. He has got the training of a charitable life from the childhood from his mother. As the parents were pious and devotees, the children were brought up in the background of strong faith and charity. The parents of Avirachan who were well aware that the children will get a strong base in moral, cultural and emotional field only through education, sent Avirachan to Asan Kalari at first as the custom of the land. When he became five years old they sent him to Government LP School Kozhuvanal and afet the lower Primary Edcucation he had studied the third forum in St. Antony’s School Mutholy. Then the education continued in St. Thomas High School and He has passed the Matriculation exam in March 1931. Avirachan was brought up with special care and affection as he was youngest son in the family. His mother was very vigilant about the spiritual growth of the children and the dear son never forget the simple advices ever in his life. Avirachan was very intelligent and firm in his words and actions from the very childhood. He was always enthusiastic in following the pious model of his parents. From the very day of his First Holy Communion, he kept a secret dream in his mind about becoming a priest. He was very exited in assisting the holy Mass as an altar boy. He was very interested in studying Catechism. He was the President and secretary of the Children’s league, CAC. He got involved in helping his parents in their works. After the school education Avirachan dreamed of following the path of his beloved elder brother, joining the Carmelite Order and to become a good servant of God in the mission fields of India. But the disapproval of the parents compelled him to join the diocesan Minor Seminary. After the two year studies in the Minor Seminary at Kottayam, he continued his priestly studies in the Mangalappuzha Major Seminary at Aluva. During the formation there he was so interested in reading and studying the rich Indian culture. 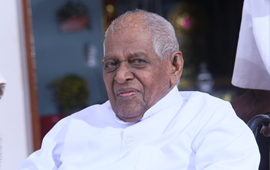 He was ordained as a priest on 21st December 1939 before the then bishop of Changanacherry, Mar James Kalassery. God has made his beloved son a new Moses to lead the destitute poor of Him to a Canan of peace and consolation. The affectionate mother advised her dearest son before going the fields of God as this, “Dear son, your eyes shouldn’t be on high at any time. You must look to the down always. Never forget the poor.” He didn’t realized the meaning of this words at that time. But as the years passed his life proved the power and depth of these simple words. The first field of his pastoral activities was the parish of Elangoi in the diocese of Changanacherry. Then he was appointed as the assistant vicar of St.Mary’s Church Athirampuzha. He recognized his call to be a messenger of the gospel to the poor of God . There was a separate small church for the Dalit Christians in the parish. When he reached Athirampuzha Fr. Kaippanplackal decided to dedicate himself for the development of the poor Dalits. Through his hard work and desire he could open the doors of the traditional parish church for these Dalits. While he was working as the Assistant Vicar of Cathedral Church, Changanacherry, he went with His brother Rev. Fr. Philip O.C.D to form a new religious order according to the cuture and tradition of India as the bishop of Selam required. But the new order was denied the approval from Rome and he returned to the newly formed diocese of Pala. After doing service as the vicar of Urumbukavu and Mallikassery Fr. Abraham was appointed as the vicar of Lalam St. Mary’S Church. He realized the pathetic spiritual life of his parishioners and for a renewal and growth of their faith , father Abraham started the Novena of the Mother of Perpetual help. While working as the Asst. Vicar of Lalam Church, the pathetic sights of the wandering children in the streets, kindled a new light in his compassionate mind . He talked with them, comprehended the throbbing pains of their little minds and adopted them to his mind as his own children. Then his dream for the better future of these children were realized by the support of some kind hearted people of his parish. With out delay a new shelter home was started for the care and well being of these wandering boys of Pala, Boys Town. Later it became a home of love, concern and solace to many young boys and a sanctuary of hope to many families. Without delay a home was opened for the girl children at Kozhuvanal. God has touched the mind of the founder and inspired him to start a new religious congregation. 10 young vibrant girls were attracted by this divine plan and came forward to dedicate themselves for the service of the poor and destitute. Thus the congregation of Snehagiri Missionary Sisters (SMS) was founded on 24th May 1969. The divine spirit lead the thoughts and deeds of the founder for a rapid development of the congregation. A twist is a must in the life of every person in the divine plan. After 6 years of the foundation of Snehagiri congregation, the founder became sick and he resigned from the responsibilities of the congregation after giving up everything to the then bishop of Pala, Mar Sabastian Vayalail. Then he spent the further days at home for rest and refreshment. The ardent spirit to lead a life for and with the poor, he started a new home at Chethimattom for the aged destitute men and spends the remaining life with them receiving the affection and care of his children, Snehagiri Missionary Sisters.